The perfect balance of adrenaline, nature and pure fun, The Squeeze by New Zealand Riverjet in Rotorua seriously hits the spot! Find out why we just can’t speak highly enough of this fantastic activity. The Squeeze; an awesome combo of jet-boating, river-wading and hot water waterfall swimming. It’s something uniquely Kiwi; there’s nothing else in the world like it! There are three main components to The Squeeze. Each of them are significantly different from one another, leading us to draw our conclusion – The Squeeze is the best bang-for-buck experience in Rotorua. Once you’re kitted up, you’ll be loaded into one of our world-famous-in-New-Zealand jetboats for a relatively leisurely ride down river (taking approximately 1 hour). With stunning scenery fringing the Waikato River and stops along the way to learn about Maori culture and points of interest (including fantastic examples of geothermal activity. Stopping at the mouth of a much smaller river, guests clamber down the ladder and begin wading up water. 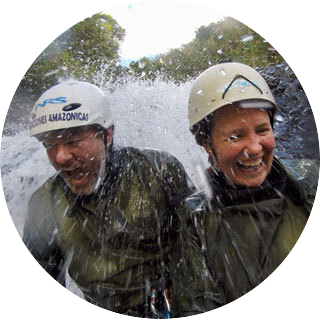 Over the course of approximately 20 minutes, you’ll squeeze, swim and manoeuvre your way through ‘The Squeeze’; a small canyon and riverway that leads to an amazing hot water waterfall! Thanks to the warm mineral water that snakes its way down the river, the walk up is comfortable and exciting (with a fun little current to keep everyone on their toes) and the float back to the boat is equally as much fun. Once everyone’s back in the boat the adrenaline-inducting part of the day begins! Racing back up the river, your driver (in our case, the fabulous Cam) demonstrates exactly what the New Zealand jetboat can do – and man is it impressive! With tight turns, near misses and g-force twists, the ride upriver will really get your blood bumping (and bring on a serious case of the giggles). Once back on dry land, you’ll debrief, dry off and say goodbye to your newfound friends. If you’re anything like us, you’ll also be trying to figure out when you can next get out on the river with these guys! The team at NZ Riverjet have thought of most things which thankfully means the gear list for guests is small. All you’ll need is a pair of togs (swimwear) and a towel. You may also like to take a pair of sunglasses and a camera (even better if you’ve got a GoPro). They’ll provide you with fleece tops, a wetsuit, crocs, a waterproof coat and a lifejacket. Should you need it, they also have gloves, beanies and glasses on hand. They’re also prepared with changing facilities, toilets and a little cafe onsite so it’s the perfect place to relax (with a complimentary hot soup) after your adventure. Who is The Squeeze Suitable for? Honestly, as one of our favourite Rotorua experiences, we’d encourage everyone to get in and give it a go. Granted, I’m a real adventure-seeker but Nathan’s a little more on the cautious side (and he loved every minute of the day). If you feel jumping out of the boat and taking on The Squeeze is a little out of your comfort zone, you can instead join the Thermal Safari trip. Regardless of the Riverjet ride you choose, you’ll share the same ride up and down the river; instead of getting wet though, the Thermal Safari drops guests off at Orakei Korako, allowing them a close-up view of incredible geothermal scenery. Though the feedback from Orakei Korako was great (and the terraces that we saw from the river certainly were impressive), we’d really recommend you stay aboard and head through The Squeeze – it was such a unique experience and so, so much fun! From the moment we stepped through the door of NZ Riverjet until the moment we left, Nathan and I were treated as if we were long-lost friends. The service was warm, friendly and just a wee bit cheeky which is, in my mind, exactly what you want from a true-blue Kiwi provider. With only three full-time staff, the crew are incredibly invested and hands-on and it showed in everything they did! We really can’t speak highly enough of The Squeeze and would recommend paying a visit to New Zealand Riverjet to practically all travellers! It offers fantastic value for money and fun whilst being achievable for all. Get yourself to Rotorua and get ready to squeeze! Heading to Rotorua? Pin this post! Please forgive the quality of our GoPro photos – it didn’t handle the low-light in the canyon at all well! Thanks to RotoruaNZ for making our weekend in Rotorua possible. All thoughts are 100% our own.